As some of you know I’ve recently been on holiday in Italy. Of course Italy is drenched in history and there are some quintessential Italian tourist spots that you can’t miss but when you start planning your trip you don’t realise that Italy is quite a large country! And with all things Italian – eating is a large part of the experience! Italy is made up of regions with each region bringing their own traditions to Italy’s culinary table. So where best to go at this time of year? Naples and the Amalfi Coast appealed to my summery needs and may I say, did not disappoint. Driving along the Amalfi coast with its lemon groves sidewinding from cliff-tops to beaches in the 36°C sunshine was like something out of an old Italian movie. Having done some research before I travelled to Naples I came across information about Vesuvius and its proximity to Naples – Pompeii (if you pardon the pun) being just a stones throw away. And it is evident that the volcanic ash that settled on and around the area has created some of the most fertile soil around. From the simple tomato and ricotta for breakfast (divine), to the tomato sauce used on pasta and pizza! Ripe plum and cherry tomatoes can be seen growing everywhere around Naples and its surrounding areas – easily grown in pots and off private terraces. Any that don’t make a fresh appearance in the kitchen are dried to increase their longevity. An often recounted story holds that in June 1889, to honour the Queen consort of Italy, Margherita of Savoy, the Neapolitan pizzamaker Raffaele Esposito created the “Pizza Margherita,” a pizza garnished with tomatoes, mozzarella cheese, and basil, to represent the colors of the Italian flag. 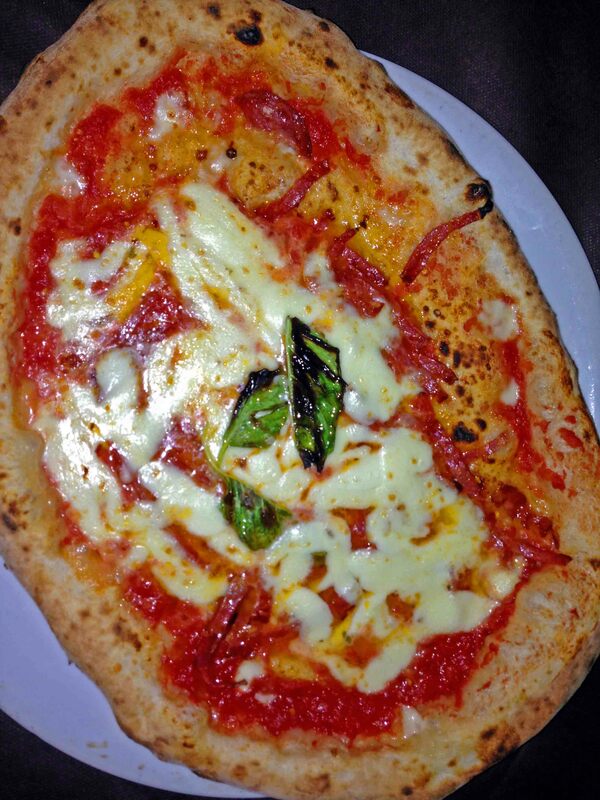 And yes, once you’ve eaten a Neapolitan stone-baked pizza, any other just won’t measure up! But what strikes you the most about Neapolitan cuisine is how much it is reliant on fresh fish and seafood. 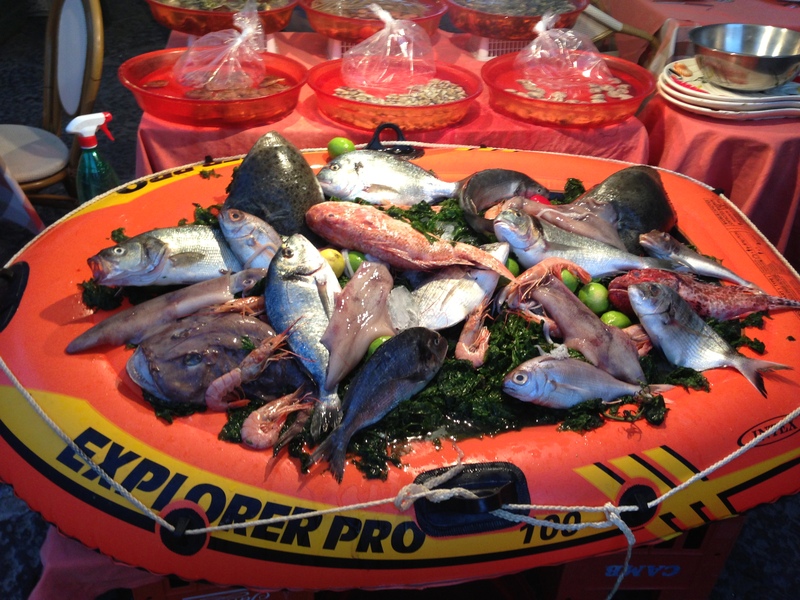 The Tyrrhenian Sea and the Gulf of Naples providing an abundance for everyone’s needs. You won’t find Spaghetti Bolognese nor a Ragu on a Neapolitan menu, these a more northern Italian, instead you will find the ubiquitous Spaghetti a la Vongole (spaghetti with clams) a traditional Neapolitan dish, and seeing as I was in Naples it would just be rude not to! My favourite though was the Spaghetti Santa Lucia (Santa Lucia being the area the restaurant was in) with its clams and mussels and a couple of prawns and langoustines hidden under the tangle of pasta. I know that bread and pasta are a major no-no but who could resist plunging a salty, crusty slice of artesan bread into the garlicky, briny juices – chin drippingly delicious!! Another delicious concoction was the traditional sweet sfogliatelle ricci – shell-shaped, sweetened ricotta filled pastries. Crunchy on the outside and then sweet and creamy on the inside. These sfogliatelle make up part of the Pastiera Italiana of which the rum baba is also a big player. In the hot early evenings everyone dresses up and goes around coffee shops for an espresso and sfogliatelle; filling a hole until it is cool enough to sit down to dinner which with its procession of courses and liqueurs (limoncello and meloncello) may take some time to get through. But as with everything Italian – food is the centre of the social occasion uniting young and old. Food is important; not something to be rushed. Not just fuel for the body.